Spring Lunch, Waipuna Hotel and Conference Centre, Auckland. The annual spring lunch was held at the Waipuna Conference Centre, Mt Wellington on Sunday August 26th . Members from across the Auckland Centres attended and enjoyed the buffet and good company. 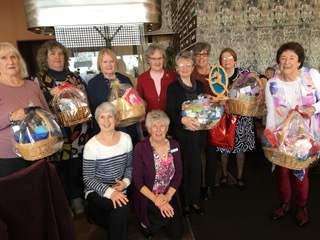 Door prizes of eight gift baskets donated by members of the Howick, Pakuranga and Pukekohe classes were won by members from Waiheke, Pukekohe, Howick, Pakuranga and Teacher Carol from the Shore. A big thank you must go to Gillian for organizing the venue and the 85 members and teachers who made it such a special occasion. The basket winners, Wray, Helen, Carol, Jill, Jessie, Lyn, Pat and Pauline with Gillian and Nina (teacher).